A worker crushed his hand when the pipe he was cutting with a torch suddenly fell, pinning his hand between the upper and lower sections. A section of the pipe he was working on had been removed the previous day, reducing the structural integrity of the lower section. 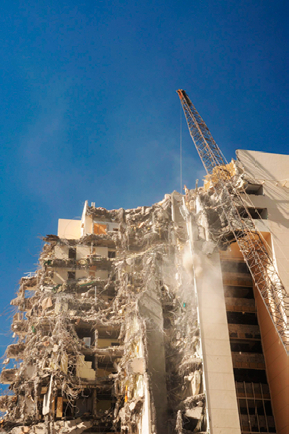 Demolition project sites are constantly changing and, as a result, so do the hazards. Workplaces that change from hour to hour present a challenge for employers and employees alike. Proper job planning and hazard assessment can prevent injuries. Material and debris removal through floor and roof openings. Inadequate shoring to maintain the structural integrity of buildings. Improper identification of utility locations. Use of hand and power tools and welding equipment. Catch platforms and falling materials. Hold regular tool box safety meetings and encourage participation. Conduct frequent and regular worksite inspections. Ensure supervisors are able to identify and control hazards. Ensure employees are properly trained and instructed in their required tasks. Reduce exposure to hazardous materials such as asbestos, lead and PCBs. Perform hazard identification and job task analysis for each new challenge. Provide the personal protective equipment required by the Regulation.